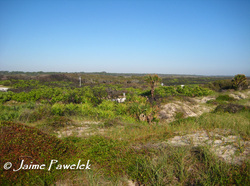 Step out of the water and up the beach and you come to Florida's beach/dune habitat, a harsh and windy environment. The plants that survive here are adapted to saline conditions from the salt spray coming off the water. Waves and wind help shape the foredune, which then transitions into a low grassy interdunal swale before climbing a steep slope. The Guana Tolomato Matanzas National Estuarine Research Reserve is home to the highest dunes in Florida (25-30+ feet above sea level) and has over four miles of undeveloped beach/dune habitat. Sea oats, railroad vine, beach morning glory, blanketflower, dune sunflower, and pricklypear cactus are all common plants in this habitat. The next plant community you come to as you travel west from the ocean and over the beach/dune is the coastal scrub, or coastal strand. 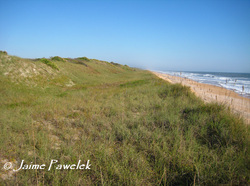 Coastal scrub is a stabilized dune habitat comprising of salt pruned woody shrubs and low-growing brambles. Wind action has dwarfed many of the trees that grow here and have pruned them into low-growing hedges on the seaward side. 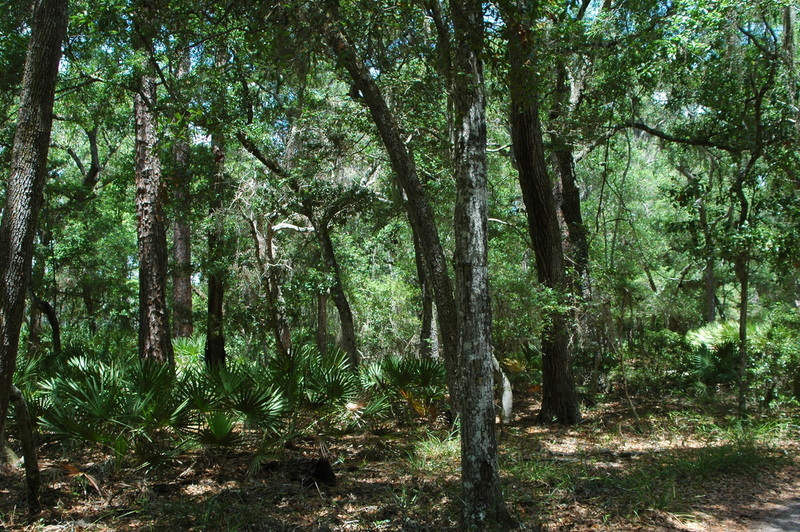 The most common plants to find growing here include saw palmetto, sand live oak, yaupon holly, smilax, America devilwood, southern magnolia, and goldenrod. This is an important plant community as it helps buffer inland plant communities from the destruction of powerful storms, but it's disappearing at an alarming rate, as this is a prime location for residential and resort properties. 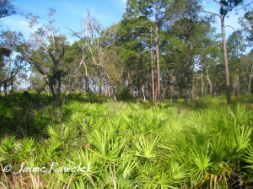 Moving inland from coastal scrub, the plant community matures into Maritime Hammock. 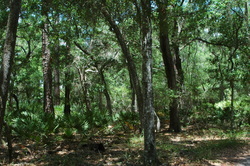 This community, which exists on old, now stable, coastal dunes, is made up of closed-canopy hardwood trees and woody shrubs. The dominant trees species in maritime hammock include laurel oak, sand live oak, live oak, pignut hickory, red bay, and southern magnolia. The most common shrubs and woody plants include American holly, saw palmetto, yaupon holly, flatwoods plum, highbush blueberry, and devilwood. Viney plants are also common, like crossvine, muscadine grape, and Virginia creeper. This open canopy forest comprises of pine trees (historically Longleaf pine (Pinus palustris), but more likely slash pine (Pinus elliotii) now due to historic logging) with a dense evergreen ground cover. Saw palmetto (Serenoa repens), rusty lyonia (Lyonia ferruginea), fetterbush (Lyonia lucida), and blueberries (Vaccinium spp.) are a few of the low growing plants found in this habitat. This plant community requires maintenance through prescribed burning every 2-4 years.